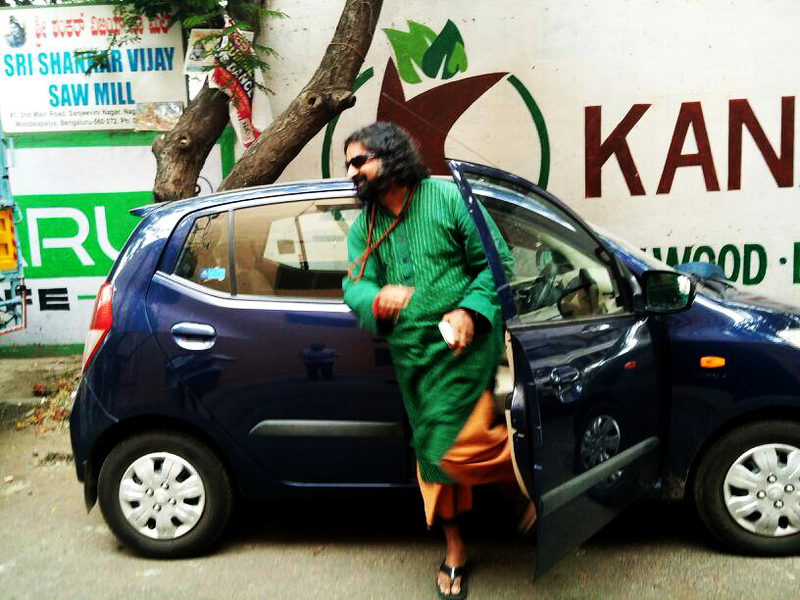 Outside Swamy Govindgiriji’s Ashram Shri Mohanji parked the car as Mr. Sethu, (Devika’s Father) could not do so. Shri Mohanji did it in one go. A treat for the eyes. These pictures reminded me of my similar experience in May 2012. In May 2012, Mohanji arrived in Serbia and we had programmes in Novi Sad and then in Belgrade. We were supposed to meet Zoran S. from Macedonia and his wife. After looking for the way to the hotel „Moskva“ in Belgrade, Rajesh (Vijay Ramanaidoo) from UK, Mohanji, Biba and I were in a car. I was driving. In the middle of the crowd, in one narrow and steep street I found a parking place. What a relief, when I found out there was no need to keep an eye on prolonging the parking each hour… It was away from the parking zone. 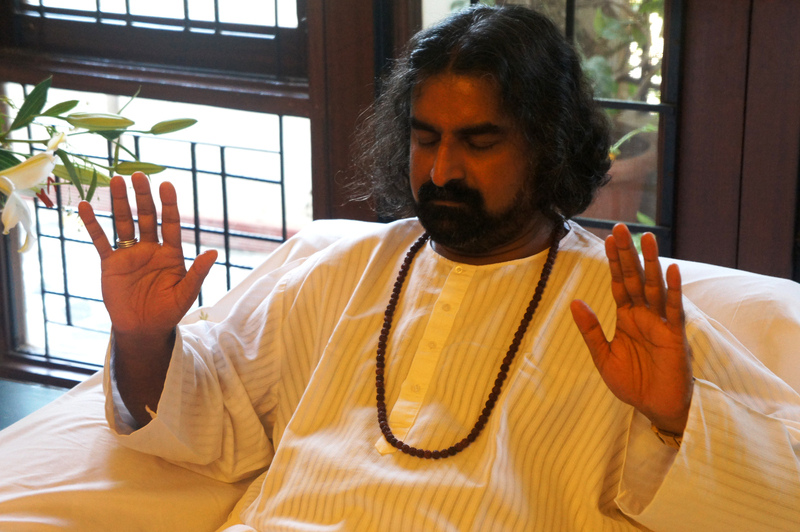 The meditation and satsang went well, people were curious or eager for spiritual nectar. Some of them pulsated from the energy which they absorbed and which was yet to settle. On the way back, I noticed Mohanji’s steps were so light as if he was walking on the clouds. Somehow carefully, as if he was paying attention not to touch the concrete too hard. He always tended to have his hands fee, he avoided carrying anything. He wanted to have freedom of movement. Yet his attention is always 100% on. He may joke, but is always aware what is happening behind, in front or in some other parts of the city, even remote parts of the globe. After we arrived to pick up the car, there was a surprise. Another car stood exactly behind ours and I was terrified at the thought of parking out of the space narrow like a box of matches!!! And furthermore, it was steep, I would have to go backwards, I would surely slide down and the car was new and let alone that there were Mohanji and others. I thought we should wait for the driver to move his car, which would be a reasonable but helpless decision, and we had to go back to Novi Sad, it was late in the evening. 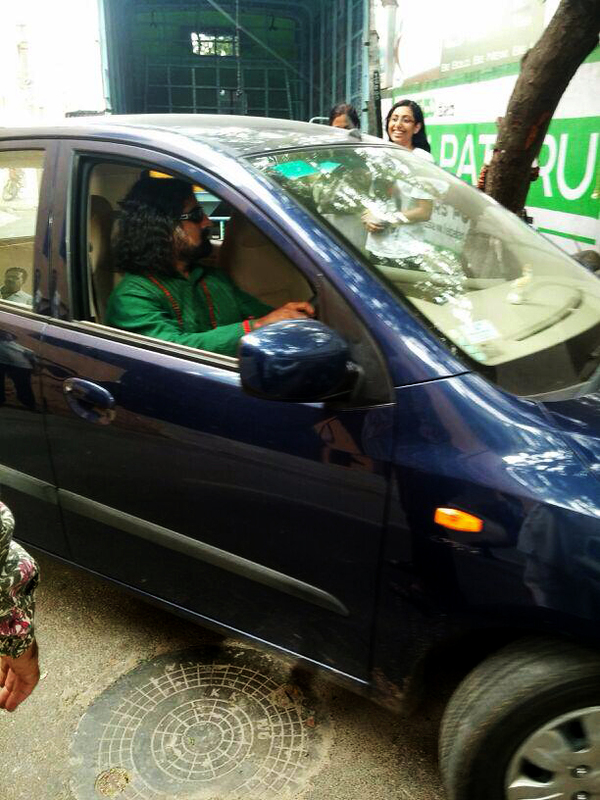 Mohanji immediately knew what the problem was and saw my desperation and decided to park the car out himself. No human apart from the few best professionals in the world could do that, believe me. It was so tight that one millimeter slide down that slope and it would scratch on the wall at one side. The other car was preventing maneuvering. Simply stuck. 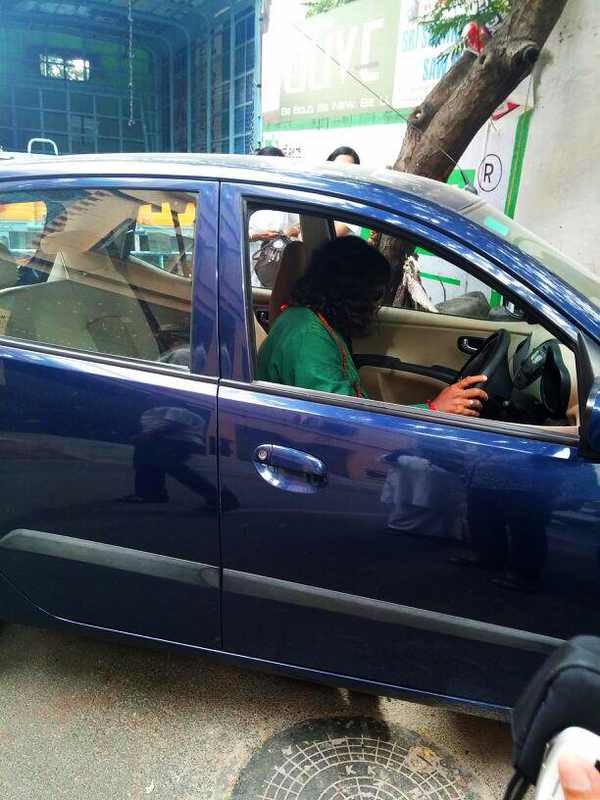 Even a bicycle would find it challenging to get out of there, let alone the car. But slowly and gradually, with some incomprehensible inner sensors Mohanji smoothly got the car out of the claws of that place. And it was even the first time he got into that car, he wasn’t even used to the commands, the feeling of the steering wheel or the clutch or the accelerator. Furthermore, it had not been long before when he had been in completely expanded state talking to people and giving answers , then shaktipats, healing and cleansing energy blockages. This was a totally different situation, non-spiritual, but no-mind state obviously makes wonders in any situation. He showed such a perfection! As if sunshine and butterflies filled me when I saw it. I was so humbled and ashamed. Instead of me serving the master, hi did it… I didn’t know where to disappear. So there it was. We entered into the car, I continued driving and we arrived home safely. While growing up, there was no time for Mohanji to waste to finish the karmic journey.. he soon taught himself how to drive. He learned to drive the car, the scooter and motorcycle by himself. He had no instructor per se, just like he has never had a proper guru in his spiritual path. This is an account, a recollection of the recent experiences that I had during and after the Retreat in Andrevlje, Serbia. I will try to keep it brief and to the point, leaving out the unnecessary details and narrate the essence of it. This might be of help to someone at some point in time when passing through the dark night of the mind. Hopefully. The story begins at the Retreat in Andrevlje, Serbia over a month ago. I arrived in Andrevlje late, when most of the people were already asleep. So, I unpacked and went straight to bed. Woke up in the middle of the night in panic and huge fear. I was not sure what was the source of this fear and I couldn’t describe it. All I know is that it was too strong of an emotion having a tight grip on my body and mind. I felt as if Mohanji has placed me on an oven, and turned the heater on the max. My mind was racing. Why these fears now? I came to the Retreat in good spirits. I didn’t expect to be thrown directly into the fire and burn. My identity was shaken and put to test. I was so restless, but somehow I managed to go to sleep at some point. Some of my fears started clarifying. One fear was that I wouldn’t be accepted by the society if I lived Mohanji’s Teachings, and openly talk about the Dattatreya or Nath Tradition. The bhajans, the ceremonial fires, the touching of Guru’s feet… – all these these concepts are not accepted in the society where Christianity is the mainstream religion. A fear of being left behind, abandoned and lonely surfaced. I was feeling as a scared little kid left alone in the woods. I felt weak. I felt powerless. 5 days in Andrevlje were dedicated to burning our negativities stored in the mind. All the fears, anxieties, doubts, etc had to be registered, acknowledged, written down on a piece of paper and put into a cardboard box. The box was then put into the ceremonial fire while we chanted specific mantras for destroying the negativities stored in the mind and written on our little pieces of paper. A lot of my stored negativities were burnt in the fire that day. But more lingered on. I was only half way through my cleansing process. Fast forward, the Retreat ended and everybody went back to their homes. I went with Mohanji and Biba to Novi Sad, to Biba’s parents’ home. As soon as we exited Andrevlje, the floods started. Floods that Serbia haven’t seen for over 80 years. Few hours later all the roads were blocked and the country was in an emergency situation. However, we arrived safely to Novi Sad. I had pending questions, doubts and fears to share with Mohanji. I waited for the right setting/moment to bring them up and clear my inner space. I really needed help. All the heaviness was provoked and brought onto the surface at the Retreat. It had to pass through the waking consciousness and be set free and let go. Not an easy task. I was struggling a lot to keep all the garbage inside and act normal and holier than thou 🙂 But for how long could I keep the stuff when I share the space with Shiva, the destroyer of minds and basher of egos – with Mohanji. The stuff had to come out sooner or later. Better sooner, so I tried to open up and share my doubts. We didn’t have enough privacy to talk, so Mohanji invited me to his room for a discussion. When I started sharing the doubts I was expecting to be understood. However, I didn’t get to be understood. To my dismay, what I got was objectivity and a strict response from Mohanji. I felt as if my ego was in a boxing arena and ambushed into an angle. I had nowhere to escape. 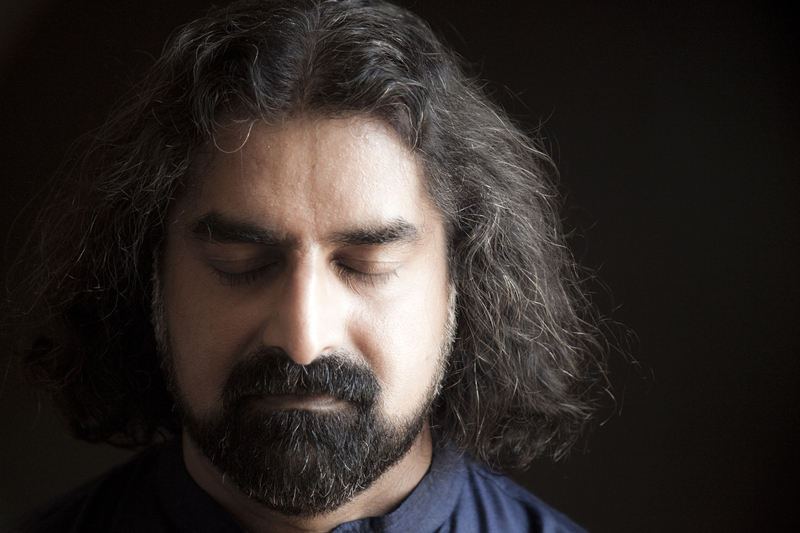 There he was, Mohanji, in front of me, ready to destroy the impurity, doubts, fears – head on. I struggled to keep everything. But, no, he was persisting, “Come on, vent it out” he was saying. I had all sorts of doubts and fears and they all came out, alas, in one go. As if the Pandora’s box was opened and all the demons broke loose in one go. It was too much to bear. If they came one by one, I may have tackled them more easily. “I’m afraid that you will eventually leave me.”, I said. For each doubt and fear I had, he was giving me an objective solution. Straight-to-the point instant solutions. Mind stuff just kept coming up with more stuff. I was attacking and pointing to the shadows of the mind all along, to this or that issue, failing to identify mind itself as the problem. While all this was happening, the mind was projecting all kinds of things. My mind never turned the finger around to point on itself. It judged others, criticized, and found faults. I felt so unloved by Mohanji all the while. I was surprised by this feeling. I was hurt. I wanted the discussion to end so that I can go out of the room and close up again into my hell shell. I was seriously considering leaving Mohanji. I felt betrayed. He said, “You know, in 5 days time, all of this will probably mean nothing.” Little did I know at that time that he was right. It was meaningless within 2 days, but at the moment it felt as a harsh disillusionment, coupled with a huge pain in the chest. I was talking stuff that didn’t make any sense. They were just coming out of my mouth. Mohanji looked like a big poisonous snake. His eyes were fuming with fire. I saw him as a Demon. He was a demon all right, but to my mind. My mind was not safe with him at all, and feeling highly endangered. When mind is under attack surrender seams impossible. And, surrender is the only cure. It was early, next morning. I woke up with what felt as a closed aura. I was disappointed and didn’t want to talk. I was shut down. I was not satisfied with the answers Mohanji gave me, I was still in the big illusion stage, and mind was playing heavily. We packed and left for Macedonia Retreat. I was driving. What awaited us was an approx. 7 hours drive from Novi Sad to Macedonia. Mohanji was sitting next to me, and Biba in the back seat. Mohanji didn’t speak anything. He was keeping silent and looked as if he was producing inner heat. I felt him as an erupting volcano from the inside, but silent on the outside. I was full of doubts. He knew that. I was deeply in the darkness, in a deep hole, and I didn’t want out. I was clinging to this state stubbornly, and I was angry with Mohanji, not knowing exactly why but quite angry. Biba intuited and felt what was happening inside of me. She spontaneously started talking in our language about things that in turn triggered myself talking about my deeply buried traumas and disappointments from the last 15 years. With each word I uttered, the content of those words was thrown into the fire that Mohanji was churning, and then that content was gone forever. All the karmas, all the traumas, disappointments, depressions, all of these were sucked into Mohanji and burned. I was liberated from so much garbage just by talking about it. Bit by bit, Biba talked me into the light. Step by step, she was digging me out of my mind’s rut, held me by the hand and walked me towards the Truth of the matter. She was the light bearer. My savior. Halfway through the trip I was good as new. The storm was over. 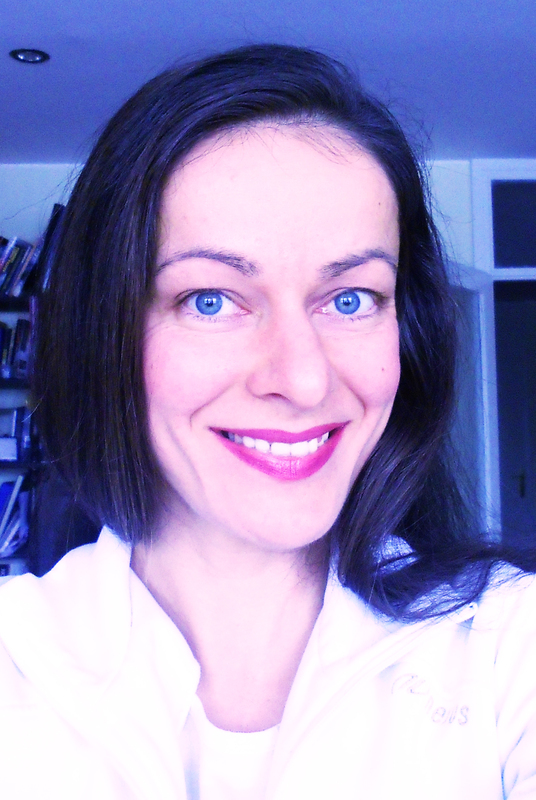 What was left was deep love and gratitude as I survived the dark night of my mind with huge help from Biba. And Mohanji did his job again. He always does. Then I knew, I was exaggerating things all along. I was everything but not objective. Emotions were working on me big time. There’s a little chance I would have come out of it by myself. It was sheer Grace I walked out of it at all. Mohanji’s Grace working through Biba. Biba was probably not even aware what she was doing. It was just flowing though her. She was just an open vessel for the Master’s Grace to work on me. It was just like an operation, or a surgery being performed on me. The key thing that Biba said, which tilted me out of the mind hypnosis, and made me aware of what was happening – she said that people are leaving Mohanji for the stupidest things like, because he wears glasses, a watch, or he uses perfumes, he wears jeans, uses etheric oil for Shaktipat, etc. And the doubt comes in a split of a second. People have huge faith and devotion for a long time, but in a split second they change their minds, find stupid faults in him, and leave him. Another key point – she shared a story about a woman that was attacked by entities. These entities were talking in her ears stuff that she thought were hers and thus believed it to be true. They were hissing it in her ears and she was feeling powerless. She was too weak to fight it. She was having strange doubts, and lack of faith all of a sudden. And then, by sheer grace she met a healer who did some healing work on her and saved her from the entities. In an instant she came back to her true self. She was back. No doubts, no judgments, nothing, just understanding the facts of the matter. Entities do exist, and can’t be seen with naked eye. They come from the back door and enter our mind and stay there. When they inhabit our space, they whisper in our ear stuff that weren’t there before, they breed doubt, fear, and anxiety, they feed on these emotions. Next key point – Spirituality is not a feel good affair. We have to deal with our negativities, and go through them. True spirituality is a hard work on our deepest shadows. Yet another key point – When a Guru accepts a disciple it is for eternity. He accepts responsibility for that soul forever and ever. It’s not a one-lifetime affair. This is huge. The Guru is responsible for liberating that soul until it indeed reaches the final Liberation. As I’m looking back at this experience, I learned that we should never make decisions when under strong emotions. Never, ever. Know that mind is playing all the time so be like a bird sitting on a dry branch. Mind will play many tricks. Mind resists changes, it thrives on patterns and concepts. Instead of looking straight in the eye of the fears and releasing them it was easier for me to attack, blame and judge the source of the fears and try to escape the whole scene that was bringing up those fears. Escaping always feels so easy. Facing fears seams so hard to the ego-mind. It will be a little small negligible thing that will cause the fall from Grace. We will not even see it coming through the back door. Small thing will lead to bigger doubts, until it snowballs into a huge lack of faith. And eventually- a downfall. So, we blame the Guru for it. Doubts are like weeds in the garden. Once they come they must be cleared out immediately or they take root and it’s even harder to get rid of them later on. When the negativities are brought up from the subconscious reservoir they must go through the waking consciousness to be released. There is no other way. Just letting go, and keeping the faith alive is the way. If Mohanji is attacking our mind stuff, then it’s for our own good. He’s attacking the negativity to destroy it and liberate us. He destroys the false so that only the True will remain. This process is very hard to bear while it lasts. But when it’s over, you will be happy that it happened. Mohanji is the greatest blessing ever. We were given a golden chance for Liberation in this lifetime. However, it’s easy to miss it… – so let us be like a bird sitting on a dry branch. When this whole event was over, I had zero alienation in my mind and everything seamed so funny from that post-event perspective. Mohanji’s objectivity and behavior was untouched throughout the whole happening. He spontaneously addressed and eradicated all these insignificant matters (which indeed seamed so significant while happening) and moved on with elegance. He dealt so patiently and non-pretentiously with my doubts and fears. I learned then and there, on the spot, how to address a problem, let go and move on with life without guilt or alienation. Mohanji’s impeccable objectivity did the magic and liberated me from a lot of negativity baggage. Every emotion leaves behind an ugly residue, and the post-emotional outburst drama is usually worse than the actual situation of the outburst. I learned that when events like this are handled with objectivity, maturity and witnesshood, there is no residue of the outbursts and their corresponding trauma. 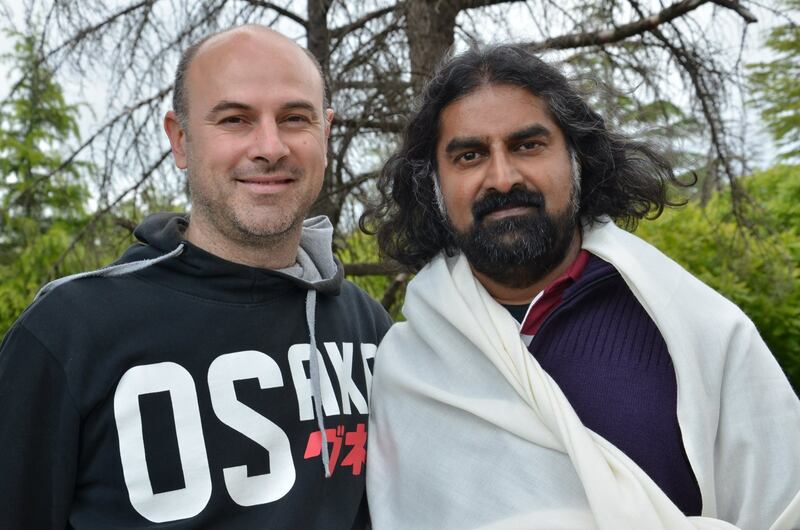 This is the beauty of being with a true spiritual Master such as Mohanji, who is perpetually connected to the source. Unlike our outbursts, Master’s outbursts (which are usually to eradicate huge blockages in the disciples) leave back no residue. They are smooth and clean always. It is our stupidity to detach from a true Master. He could be terribly unorthodox and his style may often confuse us, but he is purely purpose-bound and totally benevolent. 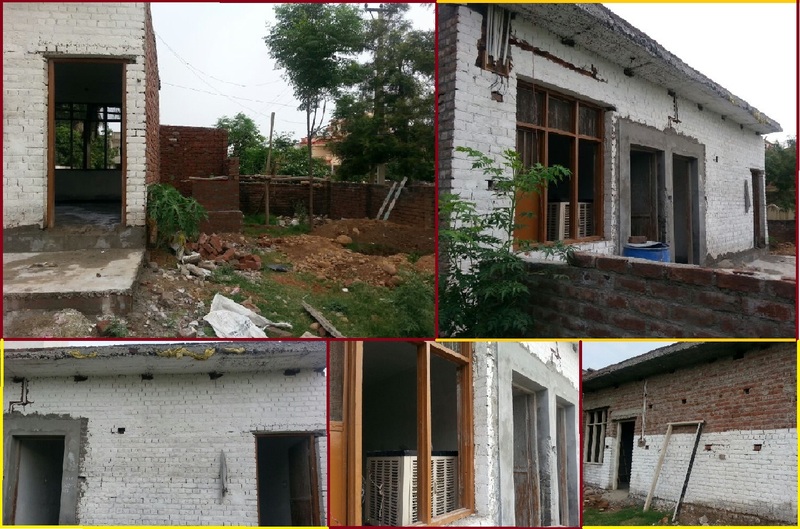 Aangan, a courtyard or veranda is generally a loving place for children to play at home but is a dream coming true for the slum or underprivileged kids In Jammu; a city in north India in the province of Jammu & Kashmir. For these kids, it is a heaven, a place to learn with love and freedom. It is a place to develop without any conditions and bindings. It is also a place where my existence developed a deep meaning. I, Sakshi Gupta, humbly write about the journey of Mohanji Ka Aangan. Muscat in March 2011, this was my first meeting with Mohanji. He asked me to do something for kids. When I came back, I discussed this with Deepali didi. She was the one who gave vision and the shape to my dream. Through her, Mohanji gave me the concept, the idea for the place, and the ultimate structure which soon became the reality! Deepali didi has been my backbone since the conception, opening and functioning of Aangan till today. It was only my Gurudev’s faith in me that we were able to actually materialize Mohanji ka Aangan. 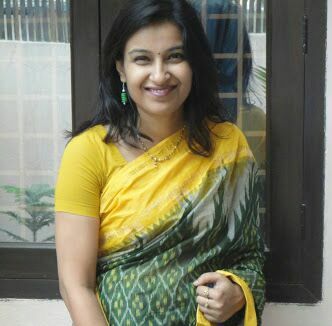 At the same time; I am deeply indebted to my husband Sumit. Without his encouragement and positive support, this dream turning to reality was not possible. I also express my deep gratitude to Reva bhua and my mother. The concept and the evolution– We live in the fast-moving world. All are running after having higher and higher education. Big big degrees and prestigious jobs! Some are after business and trading. Parents are pushing children to study hard and get maximum marks so the admissions in better or well reputed institutes are secured. If this does not work, parents are working hard to pull money for childrens’ education and hefty capitation fees many times. Parents are anxious and worried about getting their ‘toddlers’ in a good or prestigious nursery. Long queues for admissions; and fat donations at times! There is tremendous competition for the admission to any institute, college or school anywhere in the world. These are just few realities of today’s existence. Readers, please do not misunderstand us. We are not ridiculing anything in the current scenario of the education system. But; a thought arises in mind – do all have these privileges? Not all have money and intelligence too. Soft skills are gaining importance these days. Any skill is a God’s gift. No skill is better than the other. If one has academic intelligence, then other may be gifted with green fingers. In this rush hour, are we forgetting basic skills required for life? At home, can we stitch a torn dress to mend it? Or we quickly throw and buy a new one? Do we need someone to help in the kitchen? Would a bit smart office boy who knows basics of communication make a difference? How about other skills like gardening, farming, making seeds for good crop, ethnic art forms and so many other. Are we neglecting them? Mohanji ka Aangan is a small step towards providing practical education and hand skills to children. If they cannot have academic education, let these hand skills be useful in their lives. 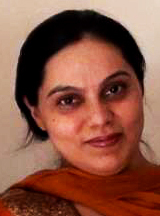 Mohanji ka Aangan was started on 2 April 2012. Though crudely built, a small room was available on an empty small land. We cleaned it. The haphazardly grown wild shrubs and plants around the room were cleared. A simple yet fresh room with four walls and a roof was neatly ready. We kept Sai Baba and Mohanji’s photo and performed pooja. This place is amidst the slums of Jammu. With blessings and deep conviction, Reva bhua, my mother and I came together and invited few children to this Aangan from the huts around. They were hesitant initially. On the day 1, 20 children came. On the day 2, some more joined and within a week, the number went up to 110. Aangan offers education and all facilities free of cost. Annadan happens on every Thursday. 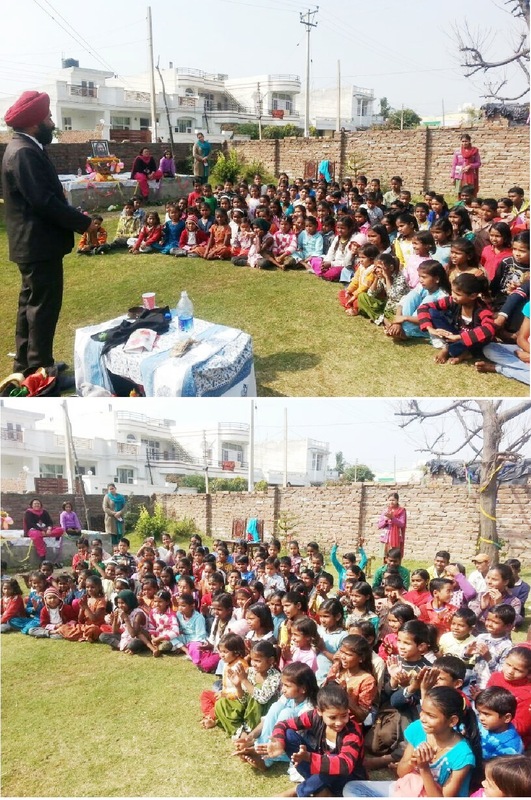 Now there are 150 children in Aangan. The Aangan runs only in the evening for 2-3 hours. The aim was to provide academic education to those who would like to have and provide skills to those who would like or are not up to the mark in academics. The choice is theirs. Some could also come if they would like to complete their home work and need help in the home work. Everything is being offered free of cost. Out of all children, some are already going to schools. Some were bright and some needed help in studies. Some were deprived of school totally due to family and financial reasons! Children aged between 4 years to 16 years. No one was said ‘NO’. All were welcomed. There are more girls than boys. We provide a meal or fruit at least 2-3 times a week. Sometimes, we gave chocolates but soon stopped as chocolate started becoming their incentive and this dependency was needed to be avoided. 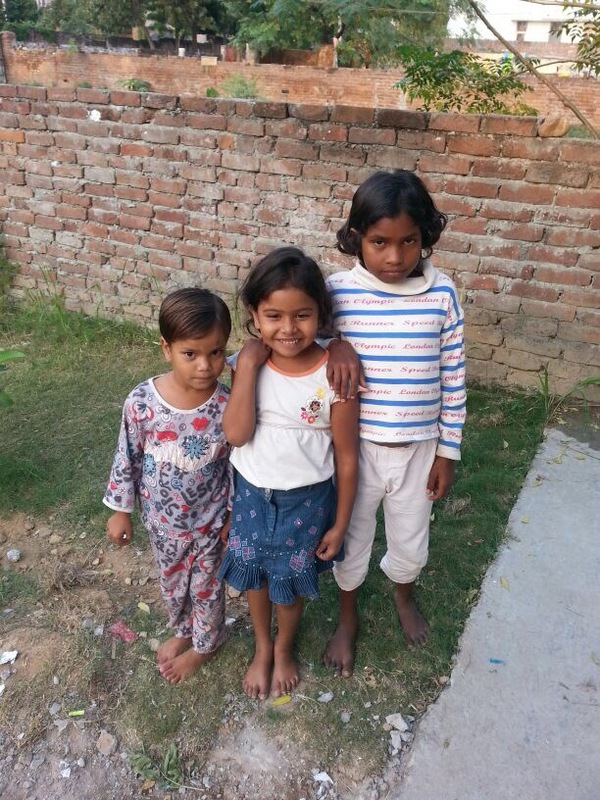 Slowly the confidence in children and their parents grew well and Aangan was full of chirpy children. The day in Aangan– Grace helped to build the concept of Aangan gradually. We ourselves were receiving clarity as we progressed. Different activities are conducted on different days of the week. The group coming to Aangan is not homogeneous. In general, the routine of Aangan is that, kids start with prayers, breathing exercises and short meditation. They may not meditate, but at least learn to sit quiet with eyes closed and learn to surrender at divinity’s lotus feet. This is followed by studies, completing homework or learning new. Then there is some time to play and enjoy in the nature. Invariably, some snacks or fruits are served. Children are back to their studies or skill activities and then it’s a time to close and look forward happily for the next day. Academics in Aangan– Children who are keen on learning receive the education here. At Aangan we have 4 sections or classes. The first section is for the students who have never been to school. There are more than 75 students in this class which also include teen aged girls who work at others houses in the morning and are free to study in the afternoon. 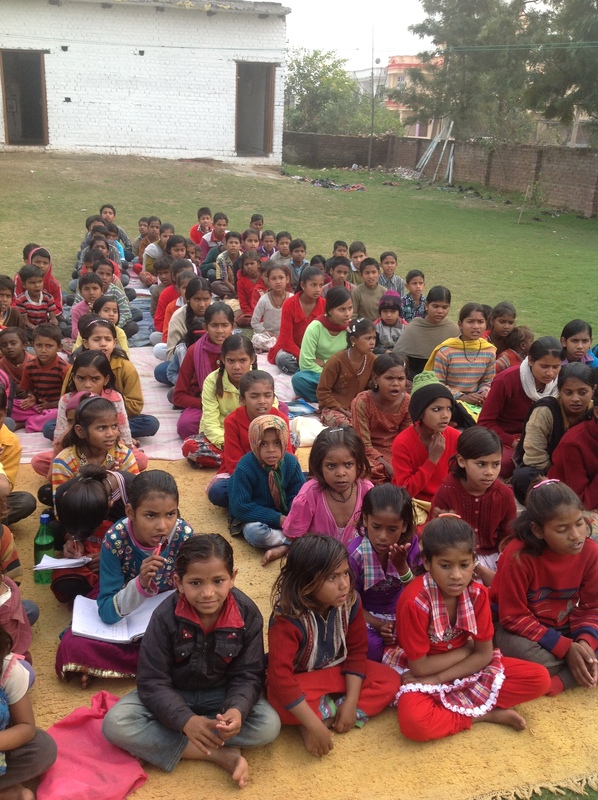 We teach basic course to learn numbers and letters to these children. 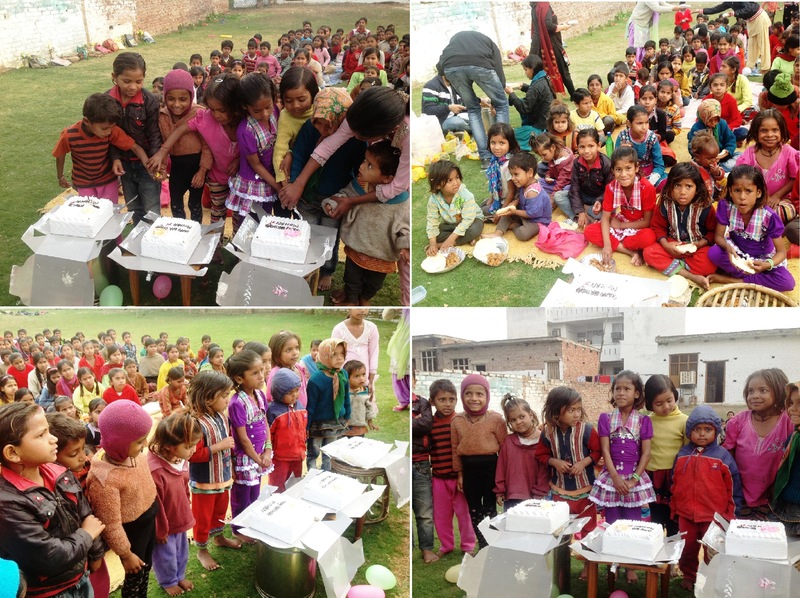 The second section is for students whom we have trained for one year in basic course and now they are studying in KG 1 at Aangan. The third section is for the students who cannot afford tuitions. All of them are studying in the government schools. These students belong to std 4 to 8. The forth section is for girls who are learning stitching with a qualified teacher. We have more than 20 girls in this section. Children are also divided according to age. For younger children, we are teaching them A, B C, D, Hindi alphabets, numbers and colors and other basic knowledge required for their age. They enjoy rhymes and bhajans too. We hope that one day these small kids will go to proper school. 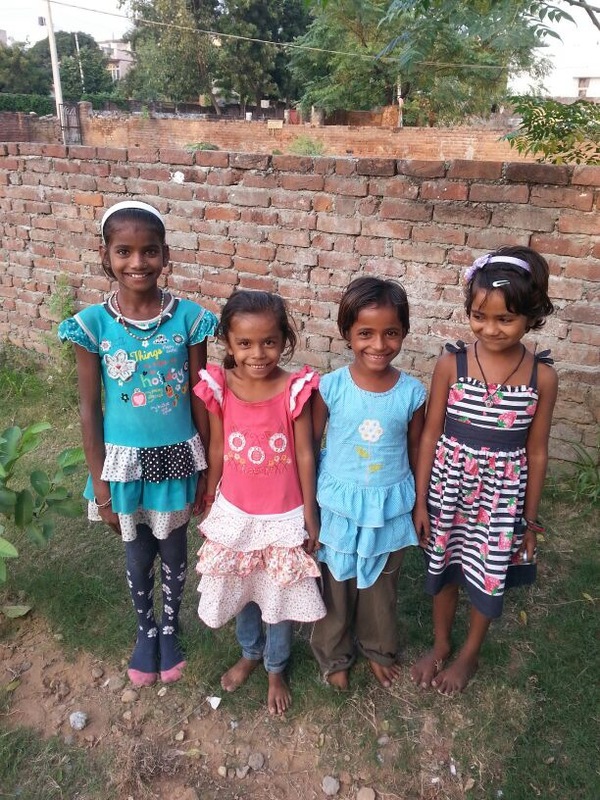 We are looking for school admission for them or if one can sponsor their education. For elder children of 4-8 std, there are teachers who impart the knowledge of Mathematics, languages [Hindi and English] and science. Teachers come 2-3 times in a week. They either teach children new topics, or help them to understand these subjects if they have not understood in the school. Children are happy to receive this type of education. Reva bhua helps a lot. She has very active participation in Aangan. For elder children, some teachers came voluntarily. Some senior college students also came voluntarily. At times, we do face a problem with consistency of teachers. We do offer monitory gratitude to these teachers. Yes! Studies are important for us. We want to learn. Fun and values: Time to fun is not only to have fun but is also for learning new things. Children play a lot. At times organized games and at times they are left on their own to play. It is a great pleasure to see them enjoying playing, shouting and screaming and laughing. Physical activity is must. It opens heart and mind becomes fresh. Sometimes, organized physical exercises are also conducted. Our kids love that. Drawing and painting is also the priority. These are beautiful mediums for children to express their feelings. It is amazing to see their thoughts through drawings. There are some good artists in the Aangan. Drawing and card making competitions are conducted regularly with different themes. Children love to sing in chorus. They sing patriotic songs, devotional songs, bhajans, some mantras, rhymes, and other songs too. At times, they loudly recite their poems. At the beginning, when they recite AUM together, it is absolutely divine to listen to that. Some children really have good voice to sing. All children love to dance too. At Aangan, we celebrate all festivals let it be Diwali, Eid, Lohri, Christmas, Navratri or Ganesh Chaturthi. It is difficult to describe in words our feelings of celebrating festivals at Aangan, sharing the joy of festival with them. They sing and dance and receive sweets and annadan. Not only children, but we also look forward to have this. Story telling is another great activity. We tell those stories of great famous people, saints, some moral panchatantra stories, and stories from our epics like Mahabharat and Ramayana etc. We also encourage them to tell stories. That evolved into the drama performance. 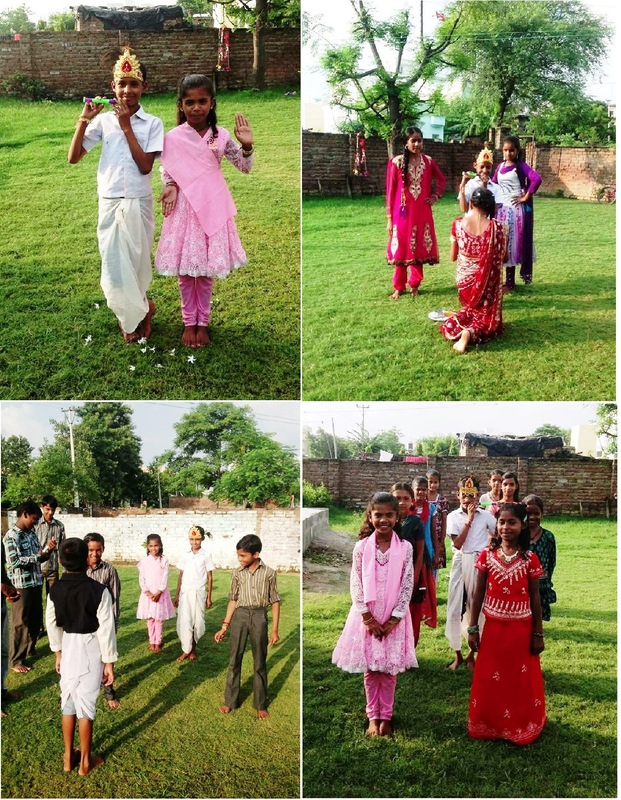 Every time Mohanji visited the Aangan, children displayed their singing and dancing talents along with performing dramas and small acts. 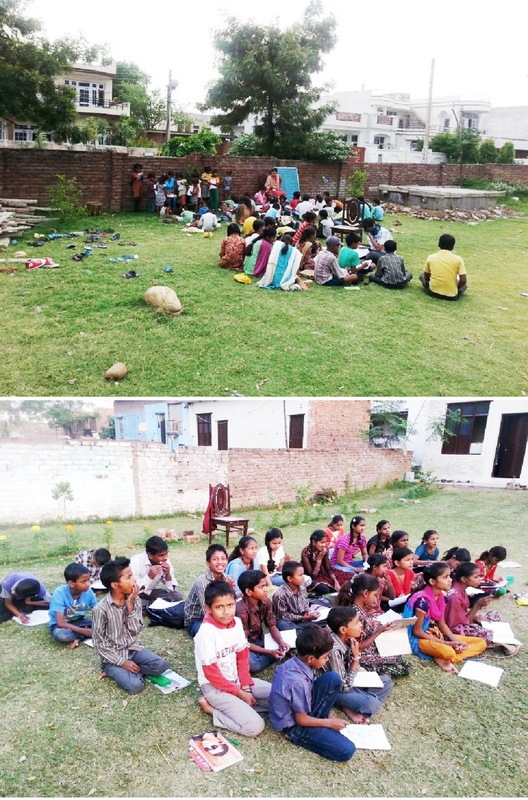 Value education is an important part the daily activity in the Aangan. Basic polite conversation, some etiquette, discipline, hard work, and avoiding wastage, and also value of parents, education, money along with being responsible, full of love, having faith..…. the list of values is endless. They are also told about personal care and hygiene. We do trim their nails; teach them to take care of hair, teeth, body and cloths. Once or twice in a month, elder children help youngsters in trimming their nails and doing hair! Few months ago, we planted some trees around Aangan. We also are trying to cultivate vegetables. Sharing, caring, loving all and being together flows spontaneously through such fun. There is a big difference in children when they joined and now after almost 2 and a half years. We also talk to them about ways and methods of how to live life and how to celebrate life. The best part is that, these kids are very receptive and full of love. They are so unconditional that at times even they teach us how to smile even if one has very limited resources. Aangan is a center of God where even we are learning from students. Skills and vocational training: Till now, we have been able to start stitching classes for girls. Girls are receiving good training and are grasping it well. We are looking forward for trained persons to educate kids with more valuable skills. In the recently happened “Waste to Wealth Workshop”, few girls from Aangan were trained. They are already learning plantation. Soon, we are starting “Candle making” skill for them. We are also trying to understand what children are good at and what would they like to do. We are sure that, grace will bring appropriate trainers to Aangan. Through these skills, we intend to raise funds so that Aangan is self sustainable. We are learning to stitch too. All Mohanji’s grace. Funds- Beginning of any new activity has its own teething problems. We are also going through that. It took time for people to understand the concept. Initially, we received some funds from friends. We are using our own pocket money to run the Aangan. Some of my mother’s friends are contributing some amount every month out of their kitties. Ashima from Dubai has been lovingly sending some funds every month for last few months and that takes care of salary of two teachers. Though not consistent, we have some teachers who worked and some are working with us voluntarily. That helps us a lot. …. parents buy so many things for children. Invariably there are extra pencils, pens and colors in the house. Not always we use all! Children use half way and throw things anywhere in the house. New note books are bought every year. Not all pages are used. There must be old text books in the school or with children. Can you please send circular to all children and parents to share that half used or unused or extra stationary and books with us? Our Aangan children will be very happy. Our kids will make use of those pages and drawing papers. They don’t need anything brand new.They will learn to read those text books too. Similarly, there will be extra toys at home. There will be used cloths or cloths which have become short for their kids. Can you please request them to share with us those toys and clothes? Are we not helping the mother earth this way by saving her treasure?…. We kept cartons in the school porch. Within no time, we received many …. many things. Toys, and books and stationary and clothes and warm clothes and so few other items like mats! We were all in tears. The Grace was showering. This was a great moral boost for us. It was a huge task to separate those items. We distributed cloths and stationary and toys. At least, our children had good and complete cloths to wear. We kept some to use them later as festival gifts. Drawing and academic classes became much more meaningful. Children had text books to refer. We express our eternal gratitude to school principals and parents and children to offer this to our Aangan. Slowly, knowing ‘what is Aangan’, some teachers also joined us. We express our heartfelt gratitude to them! Here is a unique and lovable activity that happened for Aangan. 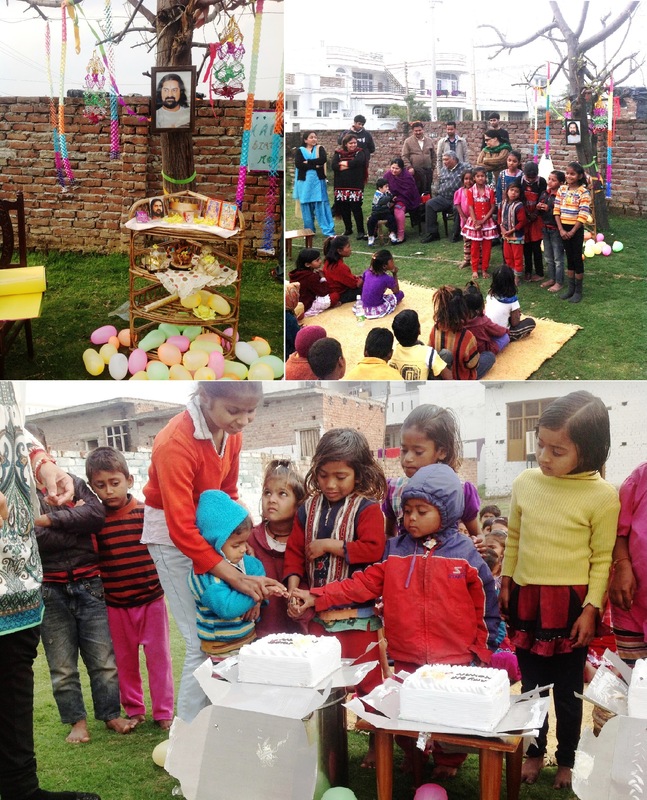 During Diwali festival of the year 2012, we organized “Make A Wish” project. In this project, we asked our children to write three wishes on a paper which they would like to receive as Diwali gift. Then we told them that only one wish would be fulfilled out of three! Kids were extremely happy. Most of the girls wanted dolls and watch and boys wanted car and cricket bats! A big surprise! 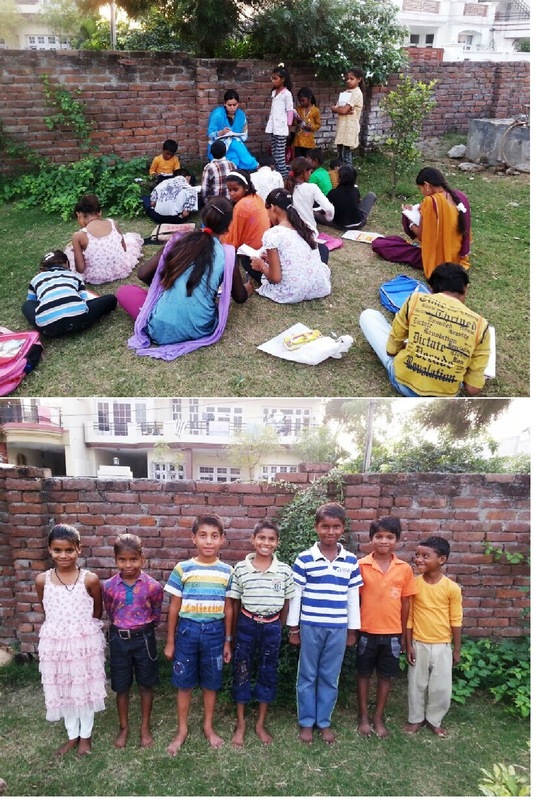 On the day of Diwali, kids from very reputed school of Jammu were called and they distributed gifts to everybody at Aangan. What a way to celebrate! 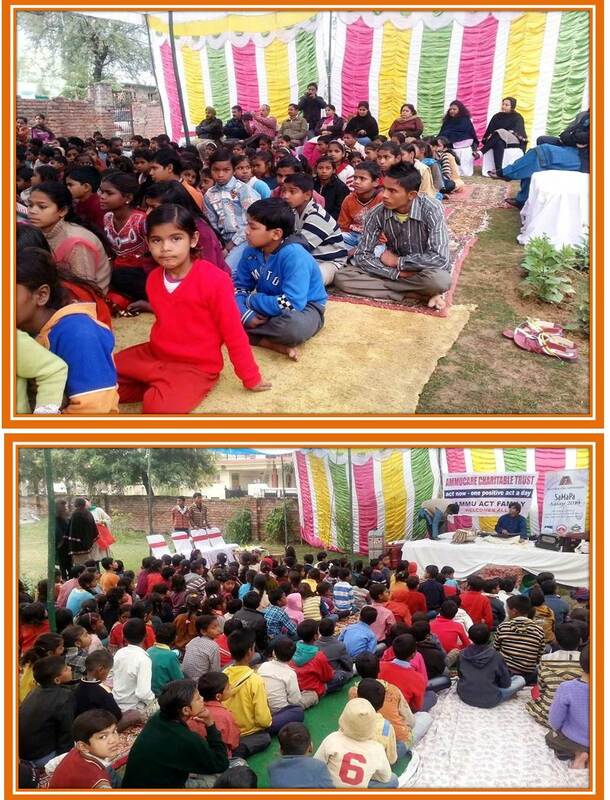 Not only Aangan had memorable Diwali but students of that Jammu school also had unique experience of knowing the realities of life and getting sensitized toward it. Hopefully these students will also learn the value of big gifts that they receive. We are ever grateful to those students for coming to Aangan and sharing their time love with Aangan kids. Happy Birth Day Mohanji!!! We are grateful to you. 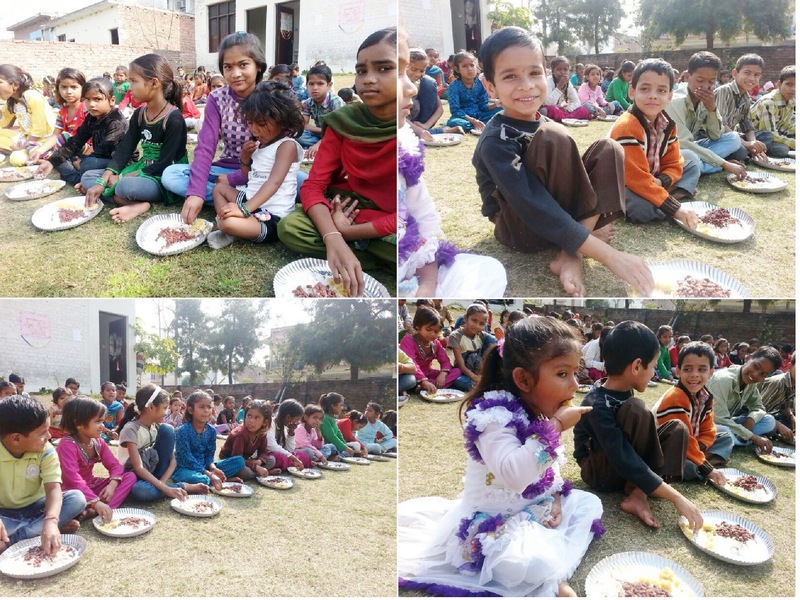 Dear beloved, the purpose of Aangan is to help under privileged kids to spread awareness as how to live happy quality life and to empower them so that they can become independent. Your love and support is this endeavor is sincerely appreciated. Your blessings are are extremely valuable for these children. Aangan is now under the patronage of Ammucare Charitable Trust. The Omnipresent Master Watches Everything… Showers Grace Always! Since some days I had been postponing meditation with my mind finding one reason or the other to support my laziness. (Apologies Mohanji, I mostly try to follow what you say but this time I got carried away.) However since a couple of days back, I had been receiving these ‘gentle’ reminders to meditate through various sources (from Him of course). While doing my daily chores late evening today, I started feeling Mohanji’s strong presence around me. At first I thought it to be my imagination but with every passing minute His presence felt stronger. He was ‘compelling’ me to sit for meditation as soon as I can. And, I did what He said. After putting my son to sleep I decided to sit for meditation myself (next to my sleeping son because I somehow feel he will benefit from it even if he is sleeping  ). I tried to look for my headphones so that I could play the POP meditation and listen to it with my headphones, so as not to wake him up. But strangely I was just not able to find them. Something told me that I should forget about the headphones and “just sit now” with as little volume as possible – and my son will keep sleeping without any disturbance! I followed. 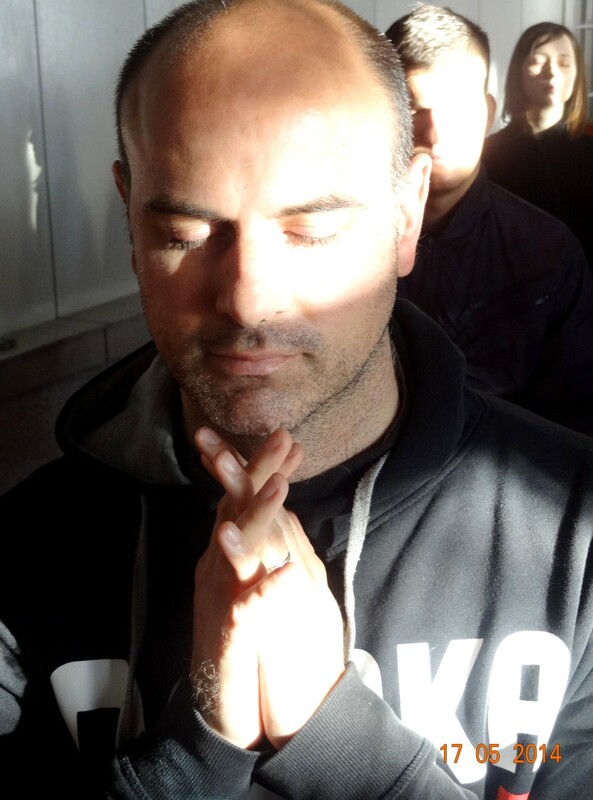 As soon as I started the meditation I started feeling very pure inside. I do feel this usually by the end of the meditation, but today was different. I have never ever felt so pure and so much filled with love within during any of meditations. As soon as I started, I saw myself sitting on a lotus flower and in front of me was Goddess Saraswati with a Vina in her hand, sitting on another huge lotus. 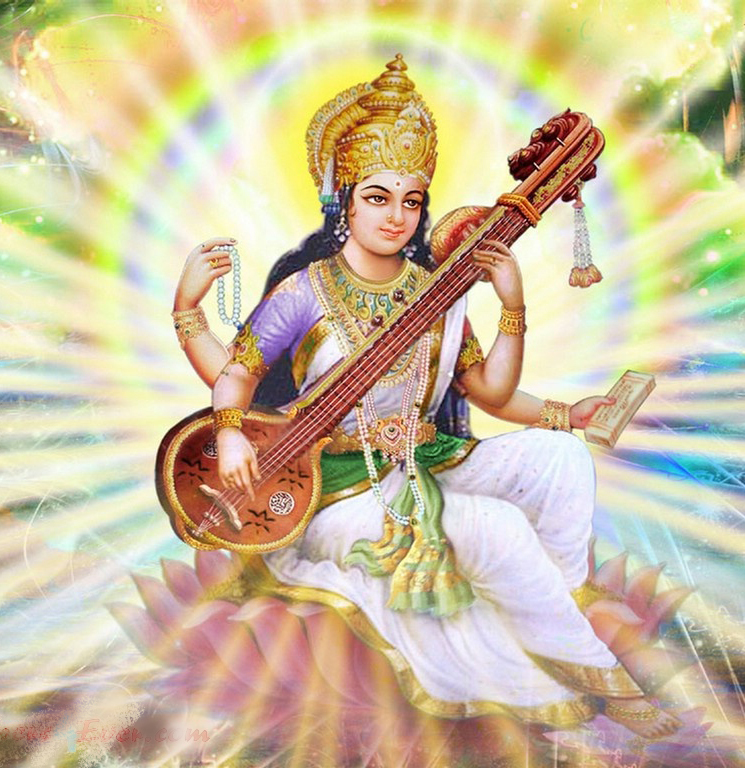 (I do believe in Goddess Saraswati, but I’m a devotee of Shiv-Shakti. So, I have really never meditated upon Her. But I am extremely grateful to Her that She came to bless me.) As soon as She left, I started feeling as if I was transparent – I had no mass – just felt myself to be a combination of several light particles. I could see above me the vast ring of strong Supreme Divine Light. I felt to be a tiny part of this vast source. This Supreme Light was showering on me with all its brightness, purity, and love. It was passing through my light-being and spreading all around the world – similar to the concept of refraction. This feeling of being transparent and a ‘light-being’ stayed for most of the part of the meditation. A little later while blessing everyone, I felt as if I have not two but four very powerful hands – two on each side – blessing everyone around me. 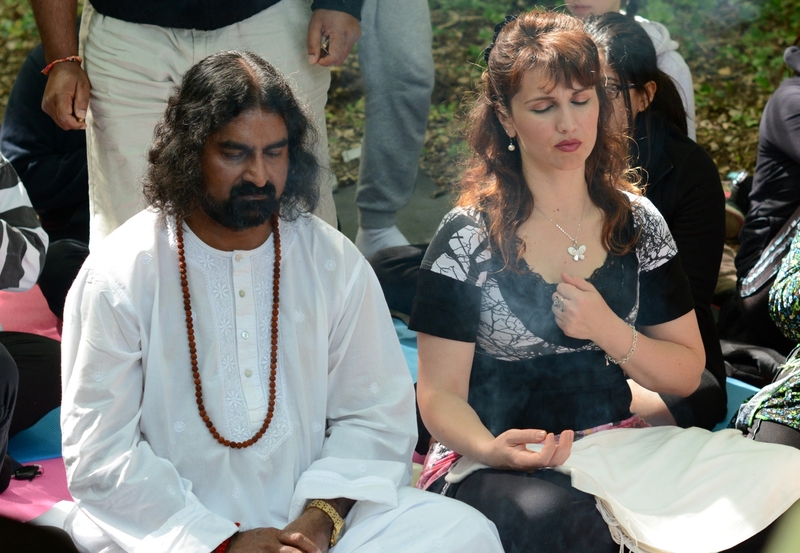 I was feeling so pure and so truly filled with love throughout the meditation… I have really never felt so much of purity and so much love within me till now…it was overflowing! Every time during the blessing mode, I do bless even a handful of people who I feel not so good about. But there is always some kind of conscious effort in that. However, this time, I felt absolutely nothing – everyone was same to me, be it my blood relatives or people I don’t know so well. All were same for me; I couldn’t differentiate my feelings for any of them. I just felt that I am a medium of light who has no feelings for anyone- good or bad, does not have a physical body, and is here in the world only to witness a story. I also felt as if I am holding something extremely heavy at this time, as if a huge responsibility (may be, not sure) but my hands/arms felt as thin as a straw. Later in the course of meditation when Mohanji asks to focus on third-eye, I saw Mohanji right in front of me. He was sitting in a meditative position too. A strong beam of white light emerged from His third-eye and entered my third-eye. I felt some energy has struck me and my body started shivering. It was after this that I somewhat felt my physical body. The beautiful feeling of being just a ‘compilation of light particles – without any mass’ was leaving now. 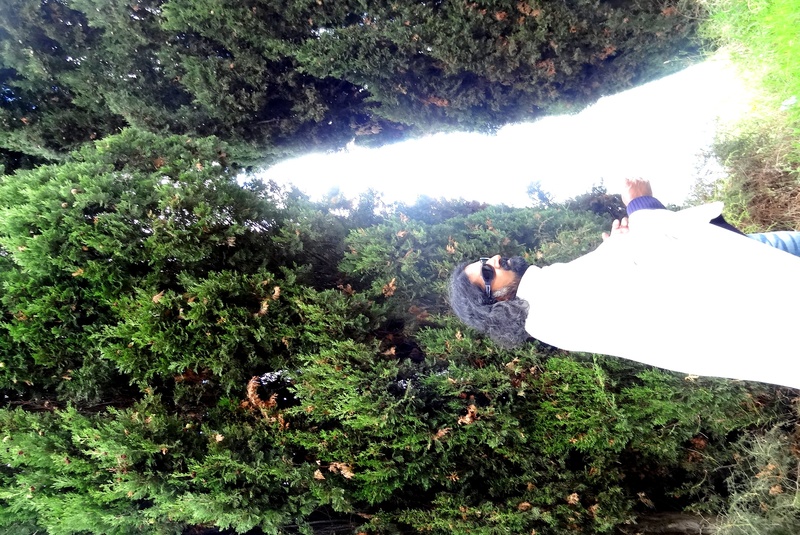 But I’m still feeling extremely light, so light that I think I can even fly … ha ha ha! Though I have been a regular reader of all the mails in the group, I never wrote about any of the numerous experiences we have on a daily basis reassuring us that Mohanji is always with us. But this one experience I had last week which I felt that I must share it with you. I have been blessed with an angel recently and I had gone to my in-laws’ place out of station for about 10 days. One day before returning my mother informed me that a robbery took place at my home while I was still at my in laws’ place. That happened during daytime, too. Shocked and puzzled as I was when I got to know about it, I tried to recall all the stuff that was locked inside my home. I was on the phone coordinating with my mom, dad and neighbors regarding some help. The first question that came to my mind was how the robbery was possible because when I left home I told Mohanji to protect my home. My husband asked me to check if his brand new office laptop was there or not. I asked my mom to check under the bed and it was there. Then I asked about the big household appliances and stuff, everything was in place. Eventually I was able to understand how Mohanji has helped me as there were very few things which I thought thieves would have stolen like this laptop and my gold earrings which I had kept in locker of my almirah. My mother said one small jewelry box was scattered near the clothes. I was sure it had been stolen but trust me it was not bothering me much and this patience was given by Mohanji for sure. I thought to myself that they would be gone and I was settled with the fact and reassured myself that whatever would have gone… let it be gone. In a few minutes I was calm and started looking the positive side of the whole incident. I asked my mother about some other things I could remember and she checked all being there still. Sitting there waiting to come back home, I started thinking to connect the dots and realized that somehow I had already prepared for this to happen. I had left all the cash and camera and the life stuff at my mother’s place before leaving and all jewelry that I had at home, I wore it before leaving. My husband, before leaving the home, had covered his new laptop in a dirty poly bag and kept it under the bed. I also got an iron grill installed over the back gate of my house a day before leaving for my in-laws’ place which in all probabilities disabled the thieves to take any big stuff and they had to use the front gate which opened on a main road. Usually, whenever I go somewhere, I never really bother to keep the expensive stuff at my mother’s place. This time it was different. It was “HE” who made me do all the robbery preparation before 😉 so that nothing is lost! Also, with him in my mind all the time, I was so calm throughout the time whereas everybody around was panicky! I wrote to Mohanji “A robbery took place and no major loss. Thank you for being there: He replied “I know nothing was lost except some bad karma of yours. It was a huge cleansing of bad karmas.” Tears rolled down from my eyes out of sheer happiness for he holds me strong all the time even though I seldom get to see him physically. After meeting Mohanji and coming under his wing, I always prayed to him that he might send me a sign or something to show that he and Sadananda Baba have some connection. I knew it was a pure mind game, but I couldn’t resist this thought. 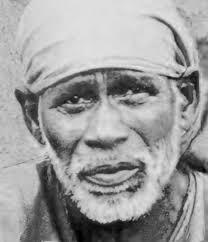 Sadananda Baba established four ashrams and allocated one festival to each ashram. 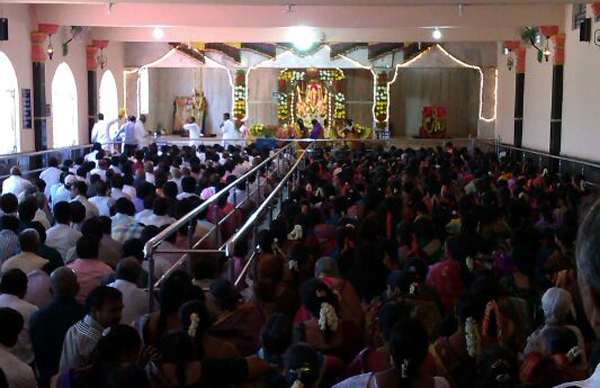 In this context the Ramnavami function is held at Rayapura, Hubali. It is also the same ashram where Sadananda Baba took his Maha-Samadhi. Before making my travel plans, I told Mohanji that I was planning to visit the Rayapura Sadananda Samadhi Ashram for the Ramnavami function (on April 8th). To that he replied “Bless You. My Pranaams and Prostrations to Sadananda Baba”. After reading his message I felt a very strange happiness. I took it casually, fooled by Mohanji’s humble nature (forgetting his true stature, and acknowledging him with merely human emotions. Not always, but yes sure, this time I did  ). I reached Rayapura on the morning of April 8th. After freshening up I went to take the Baba Samadhi Darshan. Here I observed that as I was about to enter the Ashram, they started playing my favorite Bhajan. The same thing happened last year on Ramnavami too . I finally made it into the Ashram, sat down with all the people and lovingly contemplated Baba’ s idol. Suddenly I felt that I should connect with Mohanji’s eyes. I took out his “Unconditional love is our true nature” eyecard, from my wallet. I tried to look into his eyes. I could see some Arabic type letters ( I don’t really know that alphabet) below Mohanji’s third eye ( just as I had seen Mahavatar Babaji and Sai Baba too on Mohanji’s third eye. I have shared the Mahavatar Baba experience in a previous sharing and Mohanji is aware of it). While looking into the eye card the angle of the card was such that the back part of the card was facing towards the ground. After seeing those strange letters I tilted the card in such a way that I might see the letters more clearly, towards the light. With this adjustment the card was standing straight and the back side of the card was facing Baba’s Idol. A person known to me suddenly asked me about Mohanji’s picture ( is it a new Baba?). I was a little startled by his sudden question and didn’t want to say anything. So I turned the card back, pretending that I was just looking at the card. When I flipped the card I saw Mohanji’ s image in the prostration position towards the light. 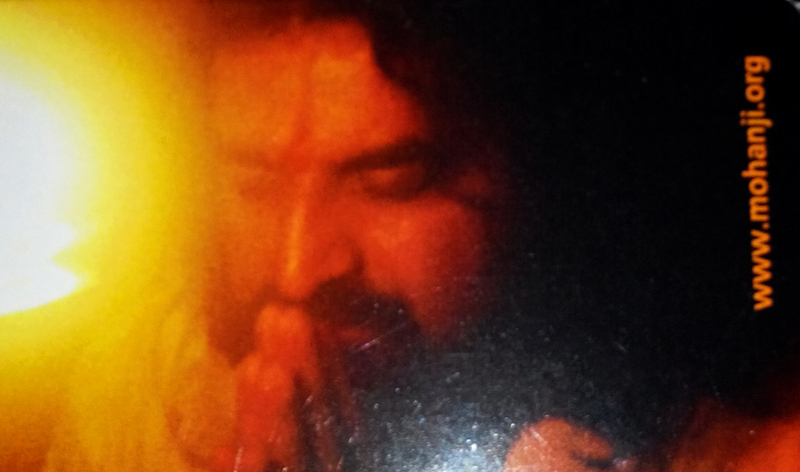 As soon as I saw his picture on the back side, his words about the prostration to Sadananda Baba came into my mind. And my heart knew ” He meant it and he did it”. I was so overwhelmed. When I came to Mumbai, I messaged him that the trip had been wonderful and that I had seen him prostrating to Sadananda Baba. Mohanji replied “I am Glad”. I asked him about those strange letters. He just said “I know” and did not say anything more about them. There are a lot of incidents that happen. Mohanji only explains if an incident is relevant, or if it is something I might need to know at that particular time. When eligibility comes, all is revealed  . After this incident, the question in my mind about the link between Sadananda Baba and Mohanji vanished. I don’t know what else to write because I never knew what to write and how to write. 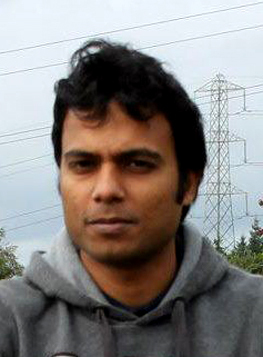 It is Mohanji who always takes care of all the events in my life. Mohanji you only did this miracle and you only witnessed it. You only asked the permission to write and you only wrote. I just want to thank you for holding my hand and taking me to the light. I know I am not worthy. I don’t know what more to write. All I can say is thank you and offer you love from the heart. Love you always Mohanji <3.